Jersey Shore Boca veteran goalkeeper Chris Konopka (Toms River, NJ) has been invited by the coaching staff of the New England Revolution of Major League Soccer, to practice with the MLS team for the month of May at their training facility in Foxboro, MA. He will be a member of the Boca U23 program this summer and participate in the Mid-Atlantic Summer Showcase League. FOXBORO, MA (May 8, 2005) – Jersey Shore Boca veteran goalkeeper Chris Konopka (Toms River, NJ) has been invited by the coaching staff of the New England Revolution of Major League Soccer, to practice with the MLS team for the month of May at their training facility on the grounds of Gillette Stadium in Foxboro, the home venue of the team. The New England Revolution, one of the inaugural members of Major League Soccer, defeated the Chicago Fire 2-0 Saturday night in Foxboro to extend their current MLS season-opening unbeaten streak to six games. The Revolution, who sit on top of the MLS Eastern Conference with a record of 5-0-1, are coached by Steve Nicol assisted by Paul Mariner and goalkeeper coach Dave Vanole. Konopka, a 2003 Toms River High School East graduate, recently officially completed his sophomore academic year at Big-East Conference member Providence College. He is a long-time member of the Jersey Shore Boca Soccer Club and will be part of Boca’s U23 team this summer that will participate in the Mid-Atlantic Summer Showcase League. Current NCAA regulations allow student-athletes with remaining college eligibility to practice with professional teams during the summer months when they fully complete their academic semester and their respective school is out of session, providing certain specific guidelines are complied with. 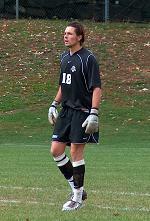 The former Raider won the starting goalkeeper spot for the Friars during the early part of the 2004 soccer season with solid performances against Drake University, The University of Rhode Island, Seton Hall University and Central Conn. State University before injuring his foot against Georgetown University on October 9, 2004. Konopka started seven games for Providence in 2004. He posted a 2.5 GAA for the year and finished 1st among all Big East goalkeepers with 5.38 saves per game and 10th overall in total saves with 38. During the 2005 spring season just ended, Konopka helped the Friars to a 3-2-1 record with an impressive 2-0 shut-out of Harvard University and 0-0 tie against the New Hampshire Phantoms, a United Soccer Leagues second division professional squad. The Toms River native also made fourteen national and international appearances last year for the U-19 US Soccer Regional Team. Konopka is a computer graphics and design major at Providence. During the 2004 NCAA intercollegiate soccer season, Jersey Shore Boca had forty-three Club standouts, including Konopka, that previously played for Boca on either their Men’s, Super Y-League, Premiere Development League, Club or Youth teams who were members of their respective colleges soccer teams.